Shopping in Jodhpur is an exciting and rewarding experience for the visitors. You'll be serenaded with intricately carved furniture, bright colors, ethnic clothes, exquisite handicrafts and more. The numerous bazaars, pavements stalls, handloom houses, etc add color to the otherwise dull city of Rajasthan. Some of the most popular shopping items of Rajasthan are: Bandhini (tie and dye fabric), Footwear (mainly embroidered jutis), Utensils, Leather items, Handicrafts, Textiles, Lac works and Bangles, Handlooms, Spices, Antiques. The Sardar Market, which is just off the main shopping area called Nai Sadak, is a good place to buy local crafts and just about anything else. Sarafa Bazaar is a haunt for silver junkies. Most beautiful, exquisite traditional jewelry can be found here. So, enhance your beauty with little accessories to match with your ensemble. Jodhpur is equally famous for the hand-dyed fabrics like bandhini and lahariya that are worn by the locals and coveted by the tourists. These garments are tie-dyed in small ornamentations or in wave-like strips on cotton or silk. Jodhpur footwear is famous throughout India. The catalogue of Indian footwear is incomplete without the mention of Mojris of Jodhpur, Rajasthan. Also known as Jodhpuri Jutis, this footwear can help give a royal touch to your dresses. Jodhpur is an antique lover's paradise. The Jodhpur antiques include textiles, silver jewellery, pottery, carved ducks, metalwork, marble figures, paintings, antiques, ivory, bed covers, wall hangings, puppets, clothes, especially designed furniture, etc. 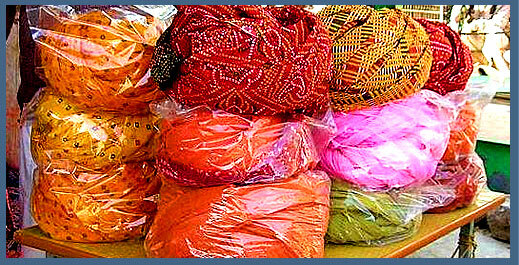 Jodhpur as a shopping destination gives the tourists an opportunity to buy some exclusive stuff of Rajasthan. Tourists will have an incomplete tour to the city if they return empty handed.